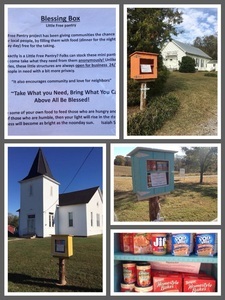 Goshen, Godwin-Chappell, and Theta church have a Blessing Box! What is a Blessing Box you ask? The Little Free Pantry project has been giving communities the chance to provide for local people, by filling them with food (dinner for the night, a quick meal till pay day) free for the taking. So what exactly is a Little Free Pantry? Folks can stock these mini pantries and others can come take what they need from them anonymously! Unlike other food pantries, these little structures are always open for business 24/7 and provide people in need with a bit more privacy. If you give some of your own food to feed those who are hungry and to satisfy the need of those who are humble, then your light will rise in the dark, and your darkness will become as bright as the noonday sun.